Pakistan: The Critical Partner Where Many Insist Bin Laden Is Alive : The Two-Way Even as Secretary of State Hillary Rodham Clinton is calling the killing of Osama bin Laden a "turning point" in U.S.-Pakistani relations, many there are insisting that the al-Qaida leader is still alive. 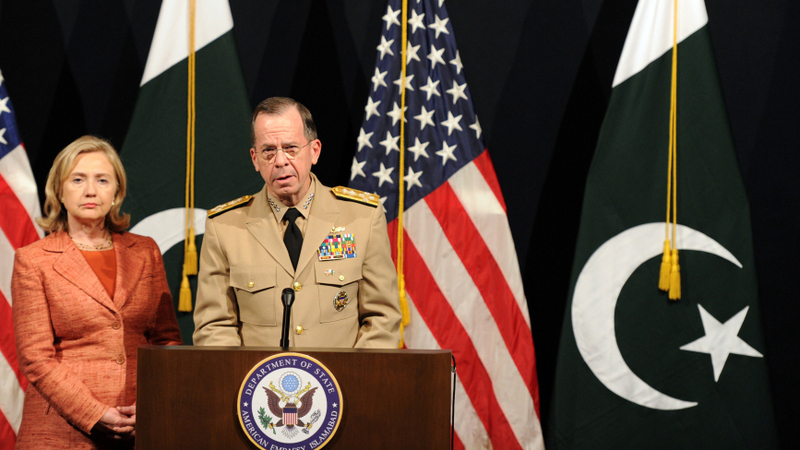 Secretary of State Hillary Rodham Clinton and Adm. Mike Mullen, chairman of the Joint Chiefs of Staff, were in Islamabad today (May 27, 2011). -- "In Pakistan, Doubts Persist About Bin Laden's Death": From Lahore, Morning Edition host Steve Inskeep reports on the people he's met this week who do not believe that U.S. commandos killed al-Qaida leader Osama bin Laden. As Steve notes, Pakistan is a country that embraces conspiracy theories and "a recent Gallup poll of Pakistanis found that 49 percent do not believe bin Laden was killed in the way the U.S. says. One woman, Faisa Agha, says she's sure bin Laden wasn't killed: "Of course not. If he was there, you guys would've been there a lot sooner."